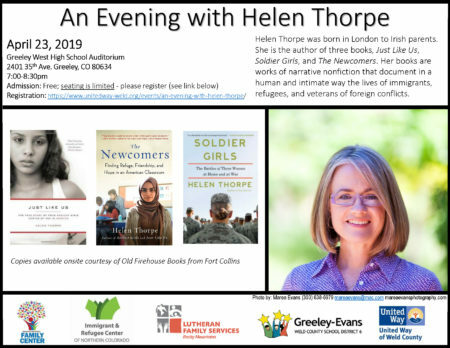 Join us for a book talk with Helen Thorpe, author of Just Like Us, Soldier Girls, and Newcomers. Her books are works of narrative nonfiction that document in a human and intimate way the lives of immigrants, refugees, and veterans of foreign conflicts. The Newcomers was described by the New York Times as “a delicate and heartbreaking mystery story” about 22 immigrant and refugee teenagers who share one classroom while learning English together. The event is free to attend but registration is required. Space is limited so register early! Click here to register.